Continuing the series about small, high-powered digital cameras, our discussion finishes up with video. And this is the part that confuses me most. These cameras shoot very pretty pictures–high-definition, widescreen, beautiful image quality. But none of these cameras allows the user to control or monitor the audio associated with that video. Let me rant on that first, and then, we’ll talk pictures. Each of these cameras can record audio with a built-in microphone, usually a stereo microphone. What’s missing: an audio meter so you can see whether the audio being recorded is too loud or too soft, a jack for an external microphone, and a jack for an external earbud or headphone to monitor the audio as it is being recorded. In comparison with the photo and video imaging in these cameras, these audio capabilities are very simple. But they are largely absent. 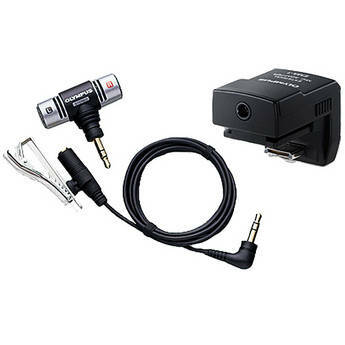 This Olympus device adds a microphone via the camera's flash shoe. It costs $60 at B&H, the source of this photo. On the picture side, the cameras are very, very good good. Even the $499 Olympus E-PM1 can record up to 29 minutes of magnificent 1080 60i HD video by just pressing a button. The newest Olympus E-M5, scheduled for April, takes a leap forward by recording H.264 .mov files, making capture and editing easier, and mostly eliminates the dreaded “jello effect” in which vertical lines wobble during a pan of even moderate speed–an improvement over current PEN cameras. This rather ugly picture is part of a rather clear video explanation of the jello effect. This is not to minimize the astonishing video image quality available from these cameras–perhaps more astonishing because motion video is not the primary purpose or function of these cameras. Certainly, we’re seeing professional videographers use their DSLRS, with special grips, to record television programs–digital photography has really changed the way we think about video production. And, if you place a mirrorless camera on a tripod, you can achieve stunning results. Even hand-held, with image stabilization, automatic exposure, and automatic focus, the Olympus and Panasonic cameras can do great things. The same is true, with varying degrees with success on the focus side, and in contrasty situations, for competitors. Of course, you can use just about DSLR to shoot terrific still pictures and still video. And, in most cases, you’ll be able to do so with an earplug, an external microphone, and much more control over the video as it is being recorded. But those cameras are bigger and heavier than their mirrorless counterparts. If you want to own a full-featured digital camera that takes great pictures and offers every conceivable feature, buy yourself a DSLR. You can buy a very good one, perhaps the Canon EOS Rebel T3i with an inexpensive 18-135mm lens, with an 18 MP APS-C sensor for just over $1,000. For me, this is a camera that’s fun to use, fun to own, and likely to leave home only sometimes. It’s just too big and too heavy for me to carry along with me. Certainly, I would bring it special events or when I feel like spending an afternoon taking pictures. I would be more likely to carry something like the new Canon G1X ($799), which offers a 14 MP sensor that’s slightly larger than the one used by micro four thirds cameras, but smaller than the typical APS-C standard. It’s a wonderful small camera, a bit heavier and bulkier than it appears to be, with an optical viewfinder (old school: you simply look through it, like a telescope) with plenty of manual control. The lens deflates my enthusiasm: it’s a zoom, 28-112 mm with not much of a large aperture: f/2.8-5.8. If this camera was offered with a normal prime lens and a maximum aperture of, say, f/2.0, I’d be all over it. Still, this is a camera I want to know more about. Essentially, I want the equivalent of a good DSLR, but I am not willing to carry around anything that’s bulky, large or heavy. This is why mirrorless cameras intrigue me. So far, I believe the Olympus E-P3 offers the best combination of solid construction, good design, superior image quality, and, most important of all, very good prime (non-zoom) lenses at reasonable prices (and, zoom lenses, too). I love the fact that these cameras (like their DSLR siblings) shoot high quality video as a kind of bonus. And as much as I have come to enjoy the EP-3, I am very intrigued by the new-ish Panasonic GX1, and even more intrigued by the E-M5, the first new Olympus for 2012. For a complete rundown on all mirrorless cameras, circa December, 2011, click here. And, BTW, here’s a really clear review of the E-P3.